Sometimes, you just have to sit down, take a deep breath and wonder who writes scripts like these? A year ago, relegation was Leicester City’s destiny, disaster their fate and mediocrity their future. A year later, they travel to the Theatre of Dreams with the title being their destiny, immortality their fate and prosperity their future, to realise a dream previously not dreamed of but now being lived and experienced. How fitting would it be for Claudio Ranieri’s Leicester City to receive a guard of honour at the Stamford Bridge – the very place where he was deemed incapable of ever winning anything? It’ll be one of the most iconic sights ever witnessed in Football, a classic example of when Football won. But let’s not think about that just yet. There’s a job to be completed at Old Trafford against a rejuvenated Manchester United before Leicester City can finally celebrate. Louis Van Gaal has already fired his warning to the Foxes by making his intentions of being a party spoiler clear in a somewhat indirect manner. Obviously, the last thing he would want to see in what has been an ordinary tenure, is Leicester City coming to the Old Trafford and beating the Red Devils to clinch a Premier League title. It won’t be the first time, though, that Leicester would pile misery upon Van Gaal’s side – the sight of Jamie Vardy frightening them at the King Power Stadium in a 5-3 victory hasn’t still been forgotten. That man Jamie Vardy would fortunately be not featuring on Sunday because of an extended ban by the FA, but that’s no reason not to be worried about the champions-elect. Swansea City went to the King Power Stadium thinking there was to be no party without Jamie Vardy, but they ended up being on the wrong end of a proper trouncing as Leonardo Ulloa’s brace and a goal each from Riyad Mahrez and Marc Albrighton comfortably took them over the line. 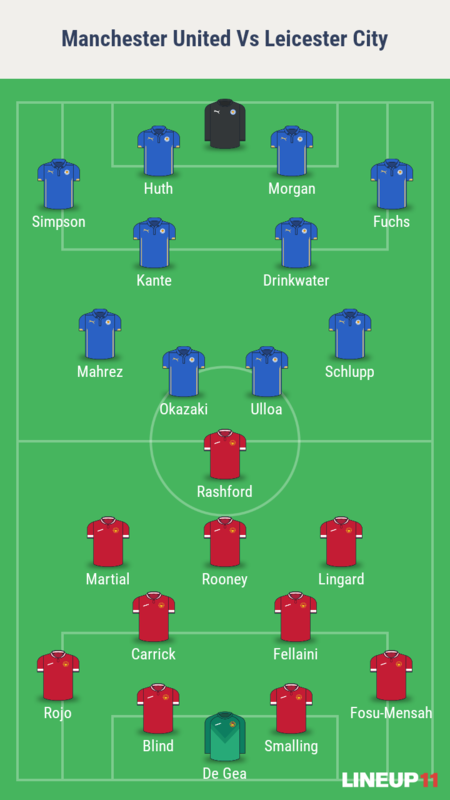 However, Claudio Ranieri might be willing to go for a slightly pragmatic approach rather than going “boom-boom” because of the threat Manchester United themselves are with a lot of pace up-front in Anthony Martial, Marcus Rashford and Jesse Lingard who will all be determined to make life tough for Wes Morgan and company; not to forget the men from the Red (ish) side of Manchester are riding high on the back of a semi-final victory over Everton at Wembley. Also, Manchester United’s defence has recently found life with the introduction of Timothy Fosu Mensah a resurgent Daley Blind who is increasingly looking like he could be a key member of this squad next season. Sounds quite delectable for someone on the look for a close contest, doesn’t it? Sure it does, but as close as it could be, there’s only one winner in this game. Remember the date: May 1, 2016. “I think we have to beat Leicester because we are still in the race for the first positions, so we have to beat them,” Louis Van Gaal said. “We cannot allow that they are the champions this weekend at Old Trafford. I think they shall be the champion a week later, so we don’t spoil the party, just postpone it a little bit. “I was the first who said that they could be champions and now a presenter [Match of the Day’s Gary Lineker] has to wear underwear when they are the champions. For me it is not a surprise; I say that many, many times. I believe in team building and the manager has done that with this team. “They have young players, very good, fantastic. I know very well [Anthony] Martial, also [Marcus] Rashford and [Jesse] Lingaard, and the experienced players, very good. “They want to beat us, it is normal. The same Everton and Chelsea. It’s important for us to be strong and solid. “It’s a difficult match because United are a very good team and [Louis] Van Gaal is an experienced manager. “I am relaxed because I watch my players. When I see my players train well, to enjoy to fight and run and help each other then I am relaxed man because I am a sporting man. “In sport you prepare everything well and when you know the players are working well and they make the performance, but the result is not good, I say ‘what more can they do?’ Nothing. The perfect mélange of an Anglophile and a Gooner, Harneet Singh Sethi chooses to laconically define himself in one word: Supercalifragilisticexpialidocious. He has been a Sports Writer for three years, having worked for websites like GiveMeSport, Fans Unite and The Roar among plenty others, a time during which the he's earned a decent reputation covering both Football (primarily Arsenal) and Cricket (primarily English Cricket). Not your average guy.